I just love how they are cracking up!! When I put the hats on them, they just stared at eachother. Like...what is on your head?! 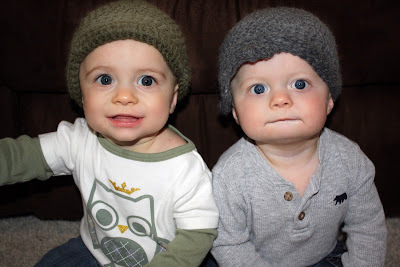 New hats made by my friend Laurel :) Cute hats for even cuter boys!! Don't forget to enter my first of 4 giveaways!!! I came across your blog a little while ago and thought I'd say hello! They are adorable. I was just trying my daughter's knit caps on her today to see if they still fit. Awe... they are so cute! Too cute! 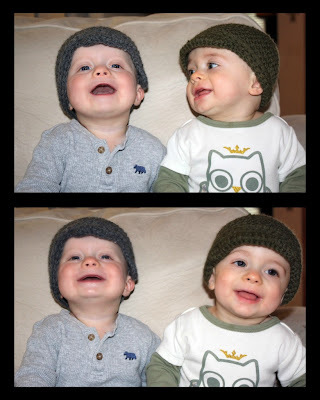 What handsome little men, and I love the hats!